In Changing Directions Without Losing Your Way, the authors who helped pioneer the 'working from home' revolution identify the six stages of change in business and in life. 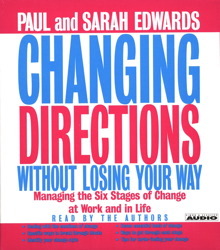 For each of these stages, Paul and Sarah Edwards demonstrate how to understand and assess change for what it is, and then recast career aspects to adapt to new realities. From facing a new reality, releasing the past, and finding an inner compass, to embracing the future, developing a strategy, to putting the show on the road, the six stages of change are clearly explained.